Have you ever gone out of town, forgotten your checkbook, or not had cash on you when it was time to give your contribution? Do you ever feel guilty about not "making up" the contribution you've missed? Are you tired of scrambling for a pen, or hunting down your spouse that carries the checkbook so you can give? By giving electronically, you'll not only save yourself time and headache, but you'll also help the church more accurately budget it's income from week to week. 2. If you haven't already created an account, click "First Time? ", enter your general information and create a user name and password. **IMPORTANT!! 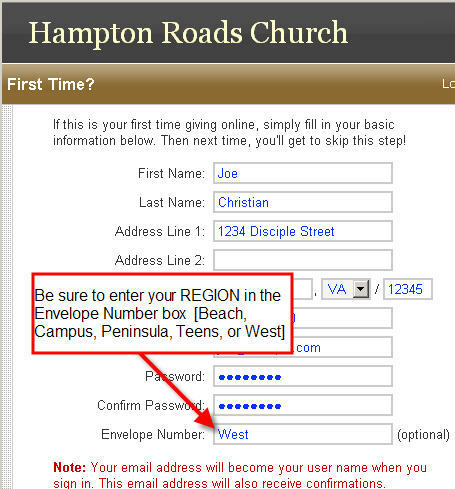 In the "Envelope Number" space, please type which REGION you're in: Coastal, Campus, Peninsula, Tidewater, or South Beach. 3. Click the "Scheduled Giving" tab. Next click the icon labeled "Use Check" in the upper right corner. ** If possible, please use the check option. It costs the church much less than debit cards. But if you must use a debit card, feel free. *Regular Contribution, Special Contribution, or Benevolence. ==> Recurring Donation Schedule: Choose how often you'd like your contribution to be withdrawn. Withdrawls will be made at the next determined interval (NOT necessarily what's shown as the "Start Date"). ==> Number of Installments: Choose how many withdrawls you'd like to have made. Once your installments have ended, you will be reminded to reactivate an installment schedule. If you'd like to just make a one-time contribution, click the "Give Now" tab & follow the same instructions. 4. Click the "Authorize" button and you're ready to go! You can log back in and change your contribution amount, frequency, or card information at any time. Click the "View History" tab at any time to view/print your giving history or change your personal information. 1. Are we required to give this way now? Can I still give with a check or cash if I want to? -Giving electronically is completely optional. We will continue to collect contribution as we always have, and you are more than free to continue giving by check or cash if you like. 2. Why would I want to do this? How does it help me? -While we all have the best of intentions, sometimes we simply miss our opportunity to give...we run out of checks, forget to bring the checkbook, don't have a pen to write a check, we haven't budgeted properly, we're out of town, we're sick and didn't make it to church, we were serving in childcare, etc. Giving electronically eliminates all of this and helps us to honor the pledge we've made to God and His church. 3. Who is this option best suited for? -It's best for those of us who give a set amount weekly, bi-weekly, or monthly by check. It's also great for members of the military on deployment or those that have erratic schedules and aren't able to consistently give at the midweek service. 4. How does this help the church? -Our weekly contribution totals fluctuate depending on time of the month and time of year (vacations/sicknesses). Giving electronically helps to stabilize the budget and allows the church to reliably predict weekly income. The church's overall contribution should also increase due to less contributions being missed. 5. Where does the money go? What are we giving to? -Our regular weekly contribution (tithe) goes toward the church's general operating budget. 6. Can we set up recurring giving for Special Contribution too? -At this time only our weekly contribution can be given electronically. 7. Are the transactions secure? Can anyone hack my banking information? -The system we're using uses 128 Bit SSL technology for data transactions. All personal, credit card, & bank information is submitted using 128 bit encryption. There is no stronger form of protection than this encryption and by doing this, we eliminate the possibility that someone might "tap" the line and extract your personal data from it. 128-bit SSL encryption has never been broken and according to RSL Labs, it would take a "trillion-trillion years" to crack the code using today's technology. 8. Does it cost me anything to give electronically? No. The church is charged processing fees, but members aren't charged anything to give in this way. 9. Should I use the debit card or check option? -We encourage everyone to use the check option because it costs the church 1/2 as much to process electronic checks vs. debit cards. 10. Can I use my credit card instead of my debit card to give (to earn rewards, airline miles, etc)? -Yes, the system will accept credit cards, but we don't recommend going into debt to give to God. As always, use credit cards wisely and pay off your balance monthly. 11. Can I give just one-time contributions instead of recurring transactions? -Yes, just click the "Give Now" tab instead of the "Scheduled Giving" tab to make a one-time contribution. 12. Is it private? Will anyone see what I'm giving? -Only the church administrator will be able to see how much you're giving and as always, that information is kept private. 13. Is this spiritually "ok"? I might feel like I'm not really giving if it just comes out of my account automatically. -That's understandable, but in reality, if we give by check we're already giving electronically anyway. A check is simply written authorization for the bank to transfer funds electronically from your account to the church account. We'll still pray for the contribution during church service, and if it helps you can simply write the fact that you're giving electronically on a piece of paper and turn it in when the collection is taken. 14. I don't want to "pay" my contribution like a bill. When I physically write a check, I feel like I'm "giving". -2Co 9:7 says, "Each man should give what he has decided in his heart to give, not reluctantly or under compulsion, for God loves a cheerful giver." God doesn't need our money and doesn't force us to give. If we ever feel like we're "paying" our contribution (regardless of the method we're using), we should consider our motives in light of this scripture. 15. What if I need to increase/decrease my level of giving? How do I do that? -Just log back in using the user id and password you initially set up. You have full access to your giving settings. 16. What kind of receipts/records will I get showing that I've given (for tax purposes)? -You'll receive an email whenever a transaction is made. You can also print your giving records by clicking on the "View History" tab.